I started with what I think is the heaviest working down to Bass Communion which is on the ambient side of ambient. Steve Wilson is also a musical historian and a brilliant producer recently remastering some of King Crimsons earliest releases. So onto No-Man this was Steve's first project and in the early days he and Tim had some minor chart success with ambient dance tracks. Steve started Porcupine Tree as a side project to No-Man but Porcupine Tree have left No-Man behind and they have gained more and more critical acclaim and increasing record sales. 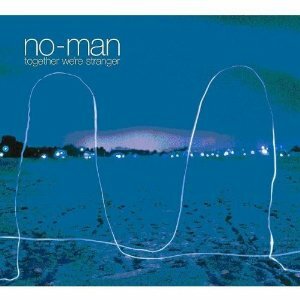 Together We're Strangers is 7 tracks some that appear to merge into others, some that stand alone. All are beautiful pieces that float like clouds through your speakers wrap you up in layers of smooth vocals and multiple instrumentation and leave you by the end of the CD wanting more and more. Stand out tracks for me are All The Blue Changes and Back When We Were Beautiful but truthfully all of these tracks are with mentioning as all are brilliant. There are 2 versions of this CD the original that has just the 7 tracks (same picture in yellow) on and a remastered version with the album replicated in 5.1 surround sound and DVD extras. I can't recommend this CD highly enough, if you like Pink Floyd or just very relaxing music that can smooth away the wrinkles of a bad day then try No-Man. From what I remember No-Man have released 5 or 6 CD's I have 3 and a DVD of a live concert and I love them all. Once you have got the Steve Wilson bug I suspect you'll end up like me buying up all his musical projects and in truth I am yet to be disappointed by a album that Steve Wilson has been involved in!